Ignas Brazdeikis, Tarek Raafat and Onuralp Bitim come on Taking The Charge to talk about among other things the 2016 FIBA U17 World Championship. Taking The Charge Podcast Episode 191: We talk about the NBA playoffs as well as the Turkish Airlines Euroleague Final Four before as well as the Adidas Next Generation Tournament and the 2016 FIBA U17 World Championship. 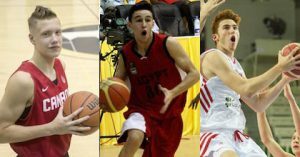 Interviews this week are with Ignas Brazdeikis of Canada, Egyptian Tarek Raafat and Turkey’s Onuralp Bitim. Episode 191: Lots of things to talk about this week with NBA playoffs, Turkish Airlines Euroleague Final Four, Adidas Next Generation Tournament and 2016 FIBA U17 World Championship.